you do realize this is a PUBLIC website an not owned/operated by LBC right? making demands for resolutions on here will get you nowhere. the update for this delivery?? As ALWAYS!!!!! Pag nasa "TEAM SOUTH" na hindi na nag babago ang STATUS!!!!! Antagal mag deliver e manila lang naman to!!! Napaka BAGAL!!!!! I sent my parcel on Saturday desperately needing it to be in our company representatives hands before 6am on Tuesday morning to present to a very important corporate customer. I was ASSURED it would be delivered on Monday, I am still chasing it around the country as even the customer services can't tell me where it is. I was not rude to them on the phone but all I received from them was rudeness and speaking over me before I'd finished my sentences. Telling me to write a complaint because they refused to help. I don't want to have to write a complaint all I want is a solution. We've potentially lost 10's of thousands of pesos in sales because of this mess up. I have insured it but does it cover late delivery? That's if it even shows up. I was even asking where our representative can go and pick it up from to save them the hassle of delivering it! But no one could tell me. The rudest person I spoke to was the supervisor!! Seriously, I will avoid them at all costs in the future. 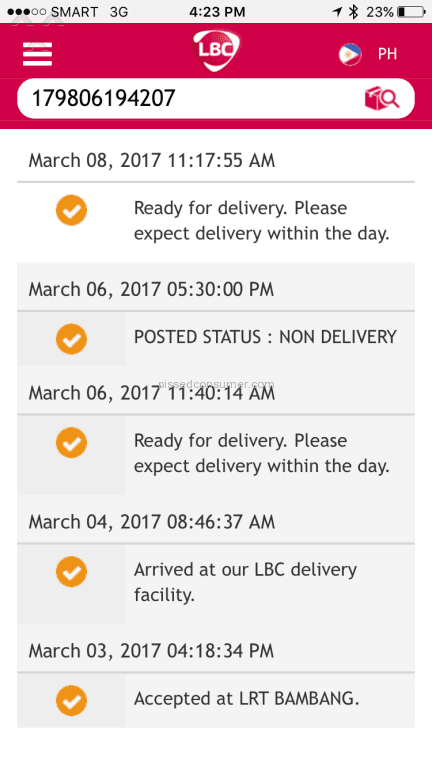 akala ko b ay mabilis ang delivery at service nyo bakit sobrang tagal 4 days na wala padin ung documets na pinadala qu d parin nakukuha ilang beses na kmi pinabalik-balik ng lbc nabua cam sur at ang sabi ni Ariel Mendoza ng iriga hub ay sinunagling daw ang text verification at di raw ito totoo kc venirify qu qung anong status ng pinadala qu at qung asan na ito kaya tumawag aqu sa kanya qung anong nangyari at qung asan na ung pinadala qu tama bang sabihin nia sakin ito na wag aqu mg base sa txt verification status kc di raw ito totoo ano yun kasinungalingan lang b yan txt verification na yan.nakaka disappoint lang kung ganyan ang service at empleyado nio.